Tubbs is back and I'ma soo happy and glad because not only did I miss him (twas only 2 weeks I know), but situations are much easier to handle with him around. 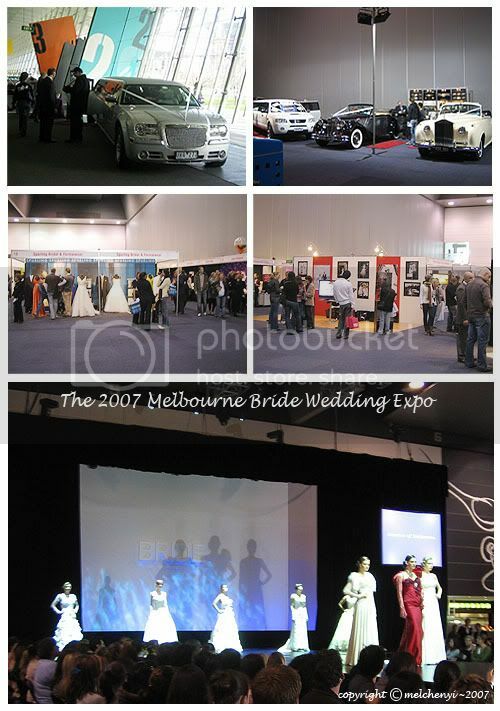 ;) So darling and I went to the 2007 Melbourne Bride Wedding Expo last Sat. I'd say I wasn't too impressed at all since I have been to exhibitions on a larger scale. I'd thought there would be few hundred of exhibitors, but there were only about 120 of them. As you can see, you can have any type of wedding car you want (if you can afford it.) Let's just say a limousine costs around AUD$800 - $1000 per hour. We also went to watch Transformers on Sunday with Eileen, Jason, Ammie, Dom, Alex(H), Byron, Sueli and her BF. Yeap it was a group outing alright, but lucky this time it was a unanimous vote to watch the same movie. And why? Because it's Transformers and hey! who can resist not watching it right? :P The movie plot was only alright, but I guess all we wanted to see was mostly the action and the gist of it. It was a little disappointing though that they changed the vehicles of the robots from the original cartoon. Like Bumble Bee became a Chevrolet Camaro instead of a Volks Wagon. And Optimus Prime was a different Truck altogether too. But it was still all good. As long as it's Transformers, anything will do. We were speculating that there's gonna be a part 2. Well, guess I've been influenced too much by my brother when I was small. I used to play with all the Transformers Action Figures that he had. And I've been hooked on them ever since. Jason and I have been mad lately, and have been browsing through Transformer stuff during work time. (ssssshhhhhh...) I lurrve Bumble Bee most. 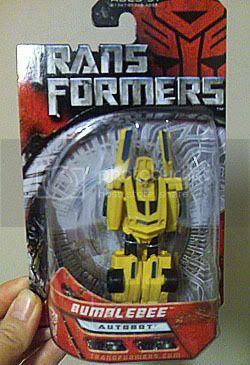 I also found out that Kmart, Target, Big W and Toy'R'Us are selling the Transformer toys. And we headed to Kmart straight after work yesterday. But I couldn't find anything I really like and thought that we should check out the other stores as well to see if they have a different variety. But nevertheless, I couldn't resist getting this small Bumble Bee first, for a cheap price of $5.99. Gurl, am very happy that both of you are still so lovey dovey... !! It is good. Love the way you dress up your blog too. Very nice !! Heehee thanks Miko, I guess sometimes in a relationship, there are ups and downs, just need to give and take.. Your new blog design also good, simple and easier to read..Keep updating okay?